Kawasaki Ninja H2R at 400 km/h - video | IAMABIKER - Everything Motorcycle! The most successful World Supersport rider of all time, Kenan Sofuoglu, aimed for a new and different sort of record. The Ninja H2R top speed would be tested and the result would hopefully be a new land speed record. 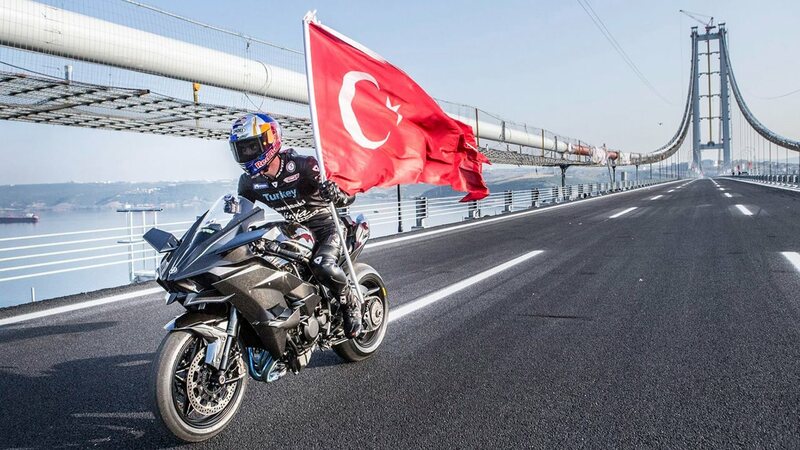 With many practice runs and attempts to get ready for the final push, the Turkish rider had been expecting to go for the Ninja H2R top speed record at the opening of a new bridge across the Gulf of Izmit, 50 km away from Istanbul, before research concluded that an early morning attempt would have the most chance of success. The WorldSSP Championship leader tried to find the Kawasaki Ninja H2R top speed at a rescheduled 5 am attempt using winglets and had a special leather suit made for the occasion. To lower the risk of a tyre blowout, the Ninja H2R top speed had to be reached in less than 30 seconds. Kenan visited the bridge numerous times and at different times of day to check the conditions, such was the lengths of his preparation for the attempt to find the Ninja H2R top speed. The record was broken just after dawn, two days before the official opening ceremony for the bridge. Sofuoglu will be back in his Kawasaki Puccetti Racing colours at Lausitzring in Germany from the 16th-18th September after WorldSSP enjoys its summer break – counting down the Rounds in his attempt to achieve a fifth World Supersport crown.